What are the top features to look for in a newsletter marketing solution? There are 4 significant functional areas to consider: Content, Template, Publishing, and Content Focused Reporting. Content – is the most important focus of the email newsletter production process. A content calendar and plan is the critical first step. Content management and workflow tools form a foundation underneath. Templates – should be geared to the unique aspects of your business and include automation and rules for content flow. The best template will allow for you to easily add curated and original content, embed social media conversations, highlight promotions and insert lead forms. Any email newsletter should automatically connect to the marketing platform you already use. 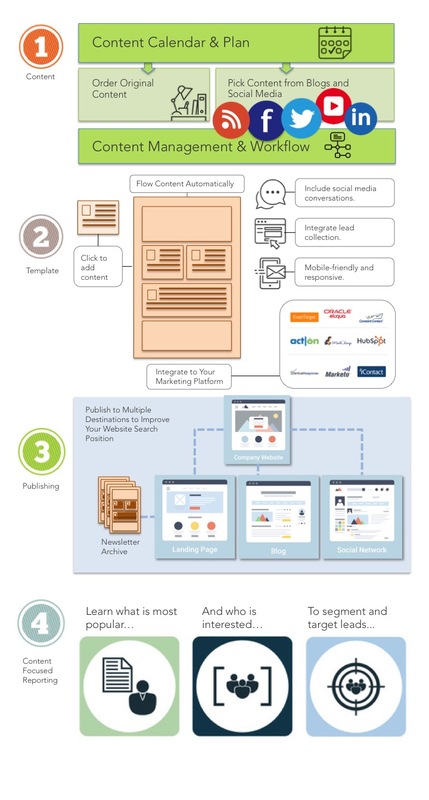 Publishing – an email newsletter should provide a logical connection to your website, blog, newsletter archive, landing pages, and social media – reinforcing your search engine position. An email newsletter archive builds an ongoing web presence for your company. Content Focused Reporting/Analytics – To gain a clear understanding of which content is most popular, and be able to identify who is reading what content, you need analytics that go beyond the basics. With this data you can identify leads and target them with additional sales and marketing outreach. An email newsletter solution that is a step above typical email marketing platforms and content marketing services, will make it easy to provide valuable information and consistently nurture your audience throughout the sales process. The email newsletter is a critical component of a complete end-to-end content marketing solution. For more information about selecting the best email newsletter system for your business, please contact us.